You already know that producing a steady stream of valuable content is a must for successful inbound marketing. But you may not be fully aware of the major benefits using a content calendar brings. Rather than being just another schedule to track, a content calendar can save you time and energy, keep your content organized and easily tracked, and ensure you allocate adequate resources to get content produced and published on time. Not only that, but you’ll never again be left scrambling for a topic to write about for a blog post that’s due in an hour. Content calendars outline your planned content in advance to make sure your company never misses a deadline or amazing content opportunity. A number of tips can help make your content calendar creation process as streamlined as efficient as the calendar itself. If your company is like most, you already have a stock of useful content that’s simply waiting for a refresher. Decide what content you can still use, whether as-is or with updates or repurposing. Any content that can’t be re-used gets crossed off the list. The rest has the potential to be crafted into evergreen content that can form the foundation of your content calendar. Brainstorming content topics starts by looking at your audience. Review your various buyer personas and plan on creating topics for each. Each persona will have different demographics, pain points, areas of interests, and goals. In addition to identifying each of your different audience types, decide on the content distribution among them. Perhaps 60 percent of your content will be geared toward Persona A, with 10 percent each going to your other four personas. Content topics need to align with your individual personas, as well as with your overall brand and industry niche. Your next step is to decide how often you’re going to publish each type of content, such as daily blog posts and monthly e-books. Determine where existing content fits into the schedule with the proper refreshing, and how you’ll generate and add new content ideas to the calendar throughout the year. 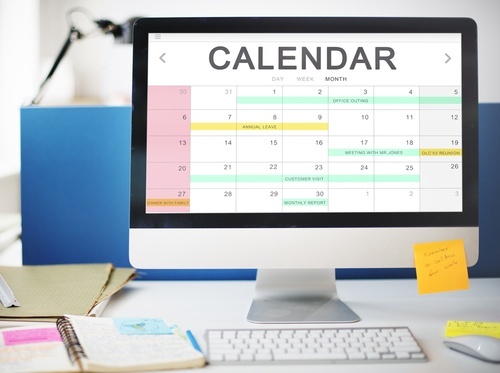 Publishing dates for all content need to be scheduled in your calendar, as does supporting activities promoting each piece of content. Perhaps you’ll be promoting each blog post by posting a link on your social media channels, or you want to create a campaign around your monthly e-book. Promotional activities deserve the same level of detail and attention as the content they’re promoting. The further ahead you plan your content, the better prepared you typically are to keep up a steady flow of relevant pieces that align with your personas and your niche. You’ll already have the year’s most important dates noted, making it easy to schedule in equally important content to accompany them. Schedule at least one month in advance to help ensure you’re not left scrambling at the last minute, although you do want a bit of flexibility for unexpected opportunities. Some of those unexpected opportunities may come in the form of breaking news or current trends. Insert and rearrange content as needed to capitalize on the hottest topics. You also want to keep eye on your competitors to see if what they’re doing sparks new ideas or strategies you can use. Regularly review and analyze your content to pinpoint which content is working the best. Look at visits, engagement, likes, comments, shares and generated revenue. Here you’ll get a snapshot of the most successful and least successful content you can use as a framework moving forward. Content calendar creation is not difficult, although it does take some time, effort and brainpower. All the effort you put into it, however, can be significantly rewarded when your company continues to consistently produce valuable content that just as consistently wows the crowd.